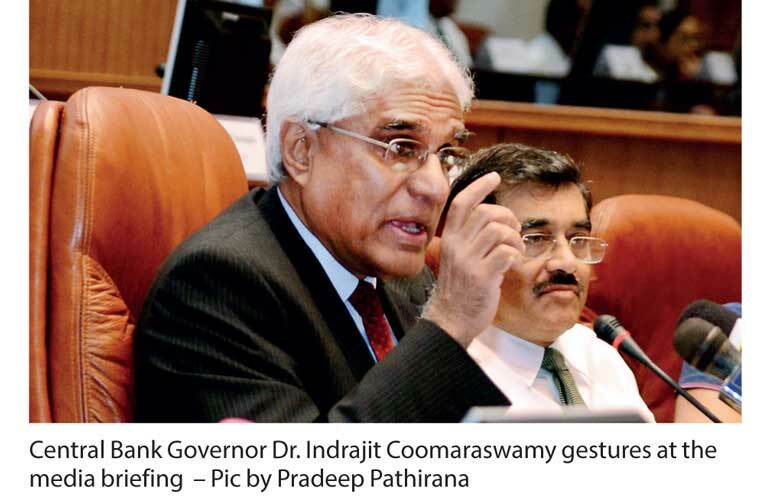 Central Bank Governor Dr. Indrajit Coomaraswamy yesterday rang an alarm bell over Sri Lanka’s political leaders calling for a quick end to the political standoff triggered by the Local Government poll results before it affected growth, warning there was no scope for loosening fiscal policy. The Central Bank on Thursday announced it had decided to keep policy rates unchanged despite sluggish growth and contraction of both broad money and private sector credit. But the imperative was counterbalanced by a pickup in international growth and possible oil price increases. The Governor also used the opportunity to express caution on allowing the political stalemate to continue as it could affect market sentiments and bottleneck investment. “For the country to have a better outcome Sri Lanka needs political stability as quickly as possible. We have not really considered the political situation when making this decision on policy rates. How politics could affect is on sentiment, which leads to a reduction in investment and growth. Clearly one would need to loosen policy, then to support growth, but you also have to look at what happens to fiscal policy. If the political situation leads to a loosening of fiscal policy, the Central Bank would have to lean against that and tighten monetary policy,” he told reporters. Political analysts have pointed out that since provincial council elections are likely in early 2019, the Government could be tempted to bump up its popularity by increasing its spending. Already in Cabinet this week approval was given to provide tabs for all schoolchildren, a Budget proposal announced by former Finance Minister Ravi Karunanayke that had since been put on hold. Other measures, including possible weather-related relief programs, could see an uptick in public expenditure. Up to November the Government had recorded a fiscal deficit of 4.9%, slightly behind its Budget 2017 target of 4.6%. The latter part of the year also saw a sharp spike in borrowing by State-Owned Enterprises (SOEs) mostly driven by the Road Development Authority (RDA), SriLankan Airlines and Water Board, Central Bank statistics showed. The Central Bank’s tasks for 2018 were set out in its Road Map that was launched in January detailing efforts at inflation targeting, foreign exchange management and further strengthening the Government’s securities market, improving the Employees Provident Fund (EPF) and ensuring banks are able to meet Basel III requirements in time among others, and it would be possible for the institution to continue unperturbed by parliamentary changes. However, Dr. Coomaraswamy noted the greater economy would benefit significantly from political stability and would be able to build on the macro stabilisation that had emerged in the last few months of 2017. Political instability could also adversely impact the debt servicing dynamics given Sri Lanka will have to repay about $ 3.6 billion each year from 2019 to 2022. The potential growth rate for Sri Lanka as the Central Bank sees it is about 5% but as growth is likely to come at about 3.8% for last year there is clearly an output gap, which calls for policy easing, the Governor said. Side by side with the output gap, the Central Bank has also observed an easing of inflation, which is now within the target range. Underlying indicators such as board money growth, which has reduced to 16.7%, and private sector credit growth to 14.7% has created a case for easing policy, the Governor conceded. Yet these imperatives are counterbalanced by stronger growth in the US, Europe, Japan, China and India that is driving a normalisation of interest rates in the US and possibly in Europe. In such a context if Sri Lanka reduces interest rates then the difference between local and international rates would increase, which could lead to an outflow of funds, the Governor warned. In addition, the increase of global oil prices, which have been tempered by record US output, have nonetheless raised the risk of higher costs that could put pressure on domestic prices. Sri Lanka spent $ 3.4 billion on fuel imports last year, a larger cost than in 2016, incurred because of a combination of higher volumes caused by power generation needs during drought periods and higher prices. Dr. Coomaraswamy acknowledged that if fiscal slippage has taken place monetary policy could not be loosened at the same time. Nonetheless, despite disappointing growth, which is likely to end up at about 3.8% in the Governor’s view, outlook surveys carried out by the Central Bank have indicated that anticipated demand, sales, investment and consumer activity are picking up, expanding hope of Sri Lanka reaching the 5%-5.5% growth targeted by the Central Bank for 2018.